NEC Philips Unified Solutions offers a large variety of business phones that ideally fulfills the needs and special requirements of today’s business environment. 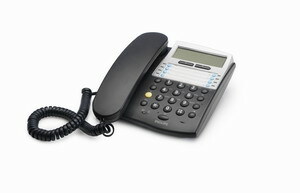 The BaseLine analogue telephone is designed for the business user. Complementary to the extensive features that may be expected from luxury analogue telephone sets, the BaseLine offers PBX specific functionality. 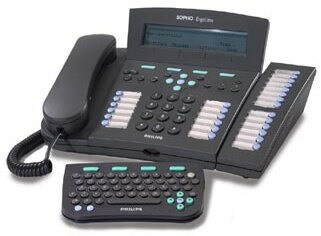 ErgoLine D325 is an ideal feature set for regular office workers, who frequently use the telephone. The ErgoLine D325 is available in a dark and light grey color, a digital 2-wire or 4-wire interface, all suitable for connection to the IS3000/SIP@NET platforms. The ErgoLine D340 is the high-end digital feature phone, capable of handling highly demanding applications (including CTI applications) and is perfectly suited for intensive users, executive/secretaries, offices and working groups, who require advanced functionality, such as messaging and multiple call handling. The set can also be operated completely handsfree. One of the benefits of using open standards within IP telephony is the use of SIP phones available in the marketplace. With these devices on can build a working space that is a true state of the art consisting out of extension, terminal, CTI application, voicemail and Microsoft Office Communicator. Our SIP@Net Call Processing software supports a SIP extension interface so that end-users can benefit from NEC Phips’ SIP compatible phones as well as the SIP sets available in the marketplace. Fixed SIP phones as well as SIP-based softphones, SIP video phones , SIP-based VoWLAN phones, SIP-based conference bridges and even IP DECT phones will give a freedom of choice to the user selecting the set on required price, performance and functionality. For SIP@Net, running on our SOPHO iS3000 hybrid communication platform, as well as on a standard server, SIP-based telephone sets are available offering ensured functionality and support. The BaseLine Pro SIP is a dual port, next generation IP phone that provides a cost-saving solution for small and large businesses. The open standard SIP protocol ensures that you can easily install this IP phone now and in the future on any SIP compliant platform. Eight user-configurable or administrator-configurable function keys with LED indicators can easily be allocated to hold menu functions like do not disturb, follow-me, and absent/present switching. For work groups, the eight function keys can also be configured as line keys depending on the needs of each user. The two-line LCD display shows call information, and the menu-driven user interface provides simple feature management. The BaseLine Pro SIP is synonymous with effectiveness, time saving and flexibility: it provides all necessary office functionality such as last number redial, call forward/transfer, call history, volume adjustment and speakerphone.